Affirmation: I let go of affection, security and power. Lee Smith, one of our beloved North Carolina writers spoke at the Olli program at NC State University this April. Her topic was, I Was Country When Country Wasn't Cool. She spoke for one and half hours and never missed a beat. She was funny and clever and very entertaining. I took out my phone at one point, not to check my messages, I hope she knew that, but to write down one of her shared quotes, "Expectations are the breeding ground of resentment." This, I felt, deserved some reflection. I'm preparing for a walk along the El Camino de Santiago in Spain. I'm going with my friend, Susan Auman. We are going with Roads Scholar. 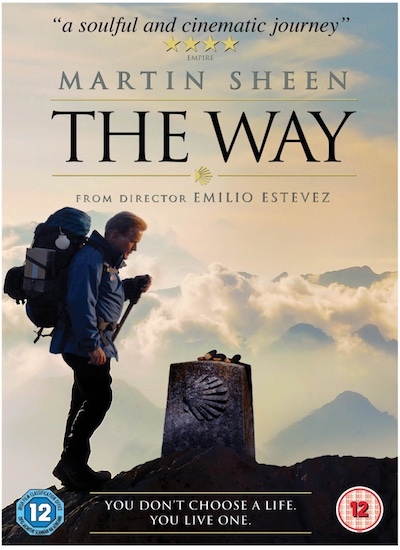 I've read the information packet and I've watched the movie, The Way, with Martin Sheen. I've got my plane tickets, hiking boots and hiking poles. I've got new walking pants that roll up and my old Outward Bound hat. I have sunscreen and Biofreeze. I've spent the last few weeks dotting the "i's" and crossing the "t's." I have had moments of complete panic and moments of total calm. At one point, I called Roads and spoke to a woman named Gale. I told her how anxious I felt and that I wanted to speak to the guide; that was not going to happen, she told me. Then she asked me what I was anxious about. "Everything!" I replied. At some point in the conversation she reminded me that millions of people have already done this. They've walked the entire path. She also reminded me that this is a pilgrimage and "a spiritual journey." With those words, the anxiety seeped out of me. It was like I had been in the dark and she came in and flipped on the light switch. I'd like to tell you that I've been calm ever since but that would not be true, although I have been calmer and that's been nice. After listening to Lee Smith, I've tried very hard not to have any expectations for my trip. I have prayed that it be "uneventful." I think that's what people mean when they speak of "traveling mercies." If you've been watching the news lately, it appears travel is filled with situations that are far from pleasant and may even be life threatening, or deadly. 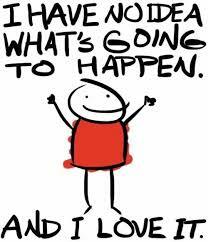 Of course, that describes most of life, don't you think? I however, once again, get to choose on what I want to focus. I have asked my Guardian Angel to go ahead and pave the path with grace and ease. That practice brings me peace. I expect this to be an adventure, perhaps one of my life's most daring after breast cancer. This adventure however, I've chosen. As I sat quietly one morning trying not to mentally pack (again) and to stay in the moment, I received a message, "Bring Rosaries." I haven't had a lot of direct communication with God or in this case, Mother Mary, but I was very sure this wasn't my idea. 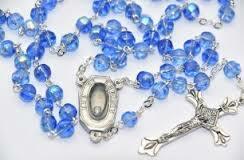 When I rose from my sitting, I sent a note to all my Catholic friends asking for Rosary donations. I felt I wasn't supposed to buy them. I believe I am to bring the prayers and energy of my dear ones from home onto and into the walk. What a wonderful response I've gotten. Some came with notes wishing us well. Some are from the Vatican, recently blessed by Pope Francis. Some are homemade by the ladies of St. Michael the Archangel. Others belonged to loved ones who have passed away. There are even finger Rosaries. Who knew there was such a thing? I've already given a few away. I know the dear ones I gifted will be holding us in their prayers as we walk along. I like knowing that. It makes me smile. When I heard Lee Smith's quote, however, it was not travel that first came into my mind. The reason I believe it resonated so loudly with me is because I recognized the frustration I've experienced over the years with several important relationships. I'm guilty of expecting people to behave in a certain way or to respond to me in a certain manner and they don't always meet my expectations. I've got some amazing people in my life and I'm not proud of judging them as wanting because they didn't live up to my expectations and perhaps because I didn't even let them know what I wanted. I've been on the other side of this also and it's a very exhausting experience to try and meet someone's expectations whose needs are quite extensive but who doesn't want to appear needy and so doesn't tell you what they are. The phrase I have adopted this year to begin my meditation with is, "I let go of affection, security and power and accept this moment exactly as it is." I say it before I begin meditating and have to say it several times during my quiet time. "I let go." How powerful is that? When I stop attaching my wants and desires on my loved ones, I give them permission to be whoever they are and I am then called upon to love them and accept them exactly as they are. Perhaps, once I can achieve that state, I can also allow myself to be the best I can be and not feel an obligation to create someone else's happiness, or even comfort. 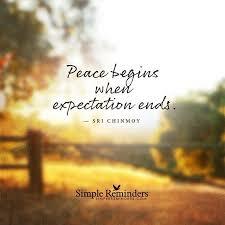 As I examine this new phrase, I wonder how much of my life has revolved around my expectations and if that's served me well or not? 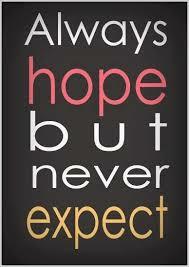 I think there's a difference between expectation and hope. The first is about the destination and the later is about the journey. I can be guilty of focusing on the destination when It comes to every aspect of my life not just my relationships or my travel but my faith, my material possessions, my health, my social life. None of that has brought me happiness or contentment. It's time to let go. Maybe by letting go I will make more room for God in my life. Perhaps by letting go over and over again, just like I do in my mediation, I will finally be content and peaceful. I think my pilgrimage to Santiago de Compostella began the day I signed up for this journey and the lessons I am to learn and share started showing up almost immediately, including in Lee Smith's talk. Although one of my affirmations is, "The best is yet to come." Well, who is responsible for that? Perhaps that too can refer to the journey and not the destination. I'll let you know as I walk along. Look for an update or two but don't expect too much! May the road rise up to meet you. May the wind be always at your back. May the sun shine warm upon your face; the rains fall soft upon your fields and until we meet again, may God hold you in the palm of His hand. I'm sitting here smiling after reading your post. I also realize that the one thing I haven't packed is my journal! I have been so busy with collecting the ingredients for repairing what might happen that I almost (but not quite) forgot to pack the journal, along with glue sticks, mini art supplies, pens, the things that will bring me joy now and later. Don't worry anyone reading this, our luggage is being carried for us maybe our "baggage" will be as well! May you both walk with light hearted joy and comfy shoes. Your blog looks great. Thanks for sharing! What a great story. I also have to work on letting go, though it's so hard..